How do I purchase the panoramas promoted in Roundme Stock? To narrow down the search results to a specific location add a country or region to your query, for example, "palace Egypt." Sort the resulting images by popularity or the date of upload, set the display preferences and filter by the allowed usage: editorial-only, commercial or both. 4) All the panoramas which fit to your request are listed. Click to preview one of them. You don't need to go back to the search page to view the other panoramas, you can easily switch between the search results (click the 'PREV' and 'NEXT' navigation arrows to compare the results side-by-side). The price of panoramas is a flat charge that depends only on the pano size. 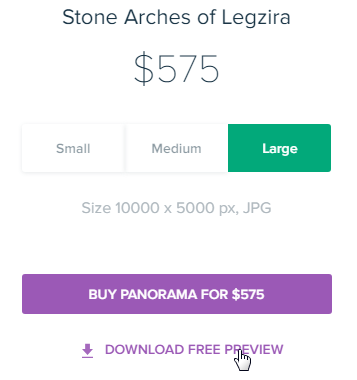 You get smaller images for free when you purchase Medium or Large. Hit like on the panorama to quickly find it in your Liked gallery later. 2) Click Buy to proceed. You may pay with the card you have already registered in Roundme or add a new one if this is your first purchase. 3) Click the Pay button, and once the charge is successful, the download will start automatically, order confirmation email will be sent to confirm your purchase. Whenever you need an image you bought, use the link from the order confirmation email. You can also download the photos you purchased at any time in the Billing section of your Roundme profile or directly from the panorama page.